Somewhere in an out-of-the-way place of the Flemish Country, hidden between fields and forests on the boundary with the Netherlands, situated near the water of the "Tongelreep", you find the "Achelse Kluis". For more than three centuries this place has been hallowed by "Ora et Labora", pray and work, according to Saint-Benedict's spirit. For centuries the monks brewed their beer, but in 1914 production was ceased. Not until 1998 the authentic Achel Trappist Beer can be tasted again. Only in the inn of the abbey, you can drink a draughted Achel beer of 5 %. Only the 33cl bottle with an ABV of 8% are commercialized. Only in the shop of the abbey you can buy the 75cl Achel Bruin, refermented in the bottle with an ABV of 10 %. 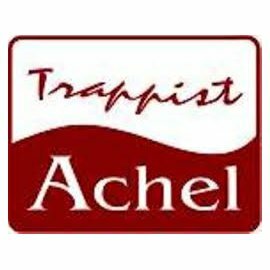 For the connaisseurs the ultimate Achel Trappist! The abbey and the brewery are not accessible for the public but the view on the wort boilers from the inn is spectacular!